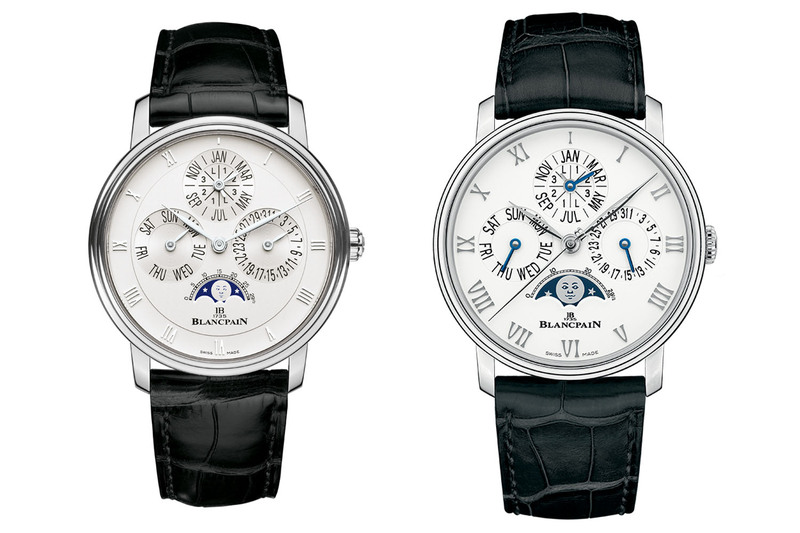 A larger case, a steel option and a refreshed face for Blancpain’s classic perpetual calendar combo. A classic among classics, the Le Brassus-based manufacture revisits its perpetual calendar complication with moon phases in 2018, in a larger 40mm case size and a choice of two metals: 18k red gold and stainless steel. 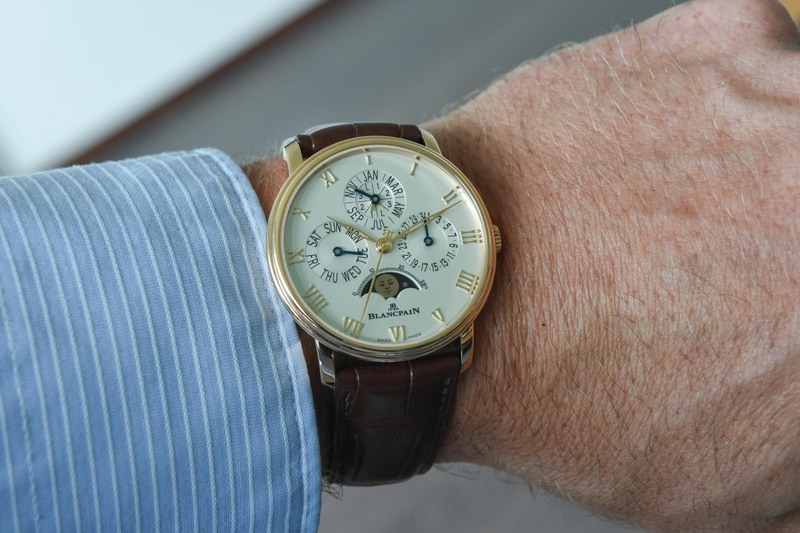 With subtle design tweaks on the dial and a secured movement, the new Villeret Quantième Perpétuel 6656 models are presented in a more contemporary case size and in a more ‘democratic’ choice of steel… Is Blancpain on the hunt for younger customers? Blancpain has come a long way since it started life as a small craft workshop on the top floor of Jehan-Jacques Blancpain’s house in Villeret, back in 1735. By the late 1950s Blancpain was producing more than 100,000 watches a year and to meet growing demand joined the Société Suisse pour L’Industrie Horlogère (SSIH, later to become the Swatch Group) along with Omega, Tissot and Lemania. 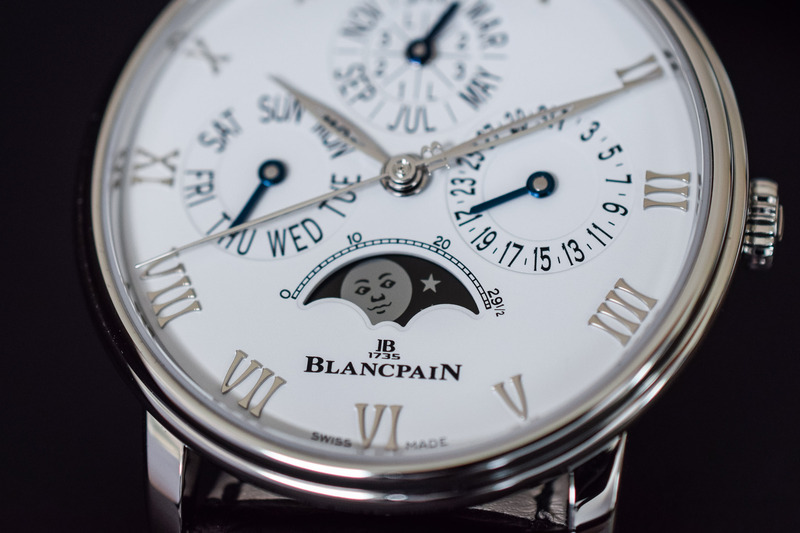 In the wake of the quartz crisis that decimated the Swiss mechanical watch market, SSIH decided to sell Blancpain in 1983 to Jaques Piguet and Jean-Claude Biver. 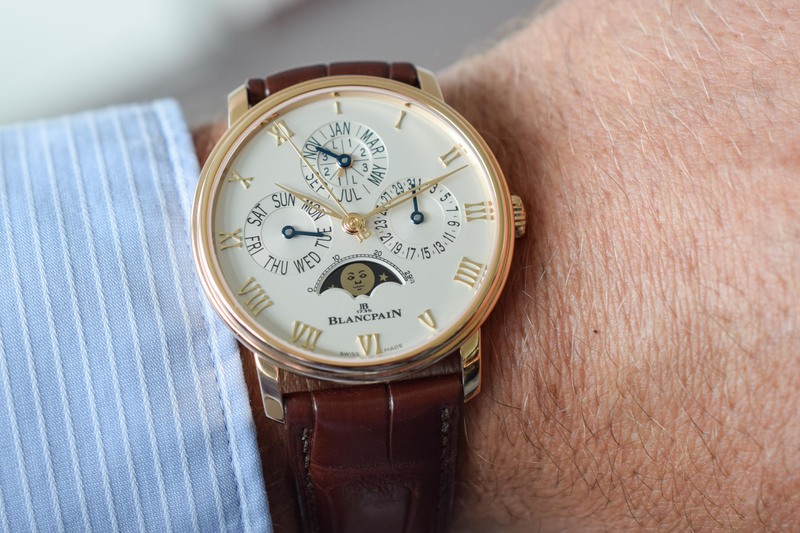 Under Biver’s command, the mission at Blancpain SA was to resume the production of ‘grande complication’ watches in the most traditional, classic vein. 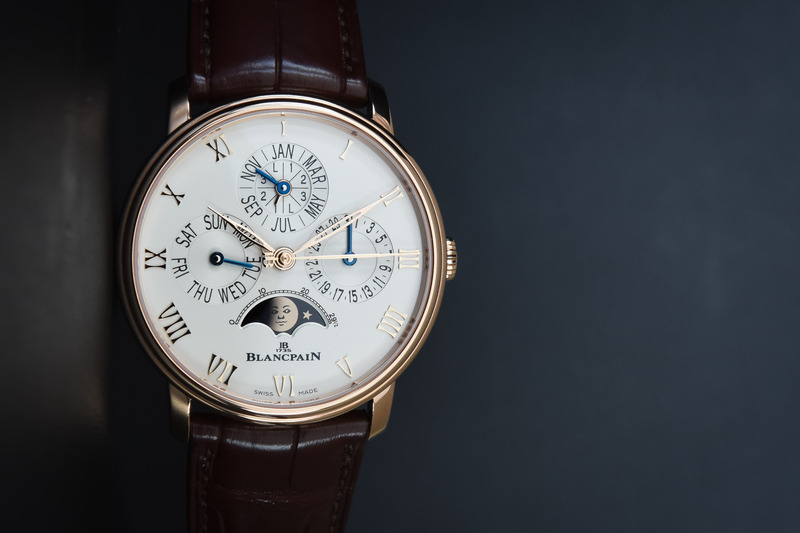 The first watch to emerge from the Le Brassus manufacture was a complete calendar with moon phases that sold like hot cakes, proving that classic watchmaking still had its place in the world. 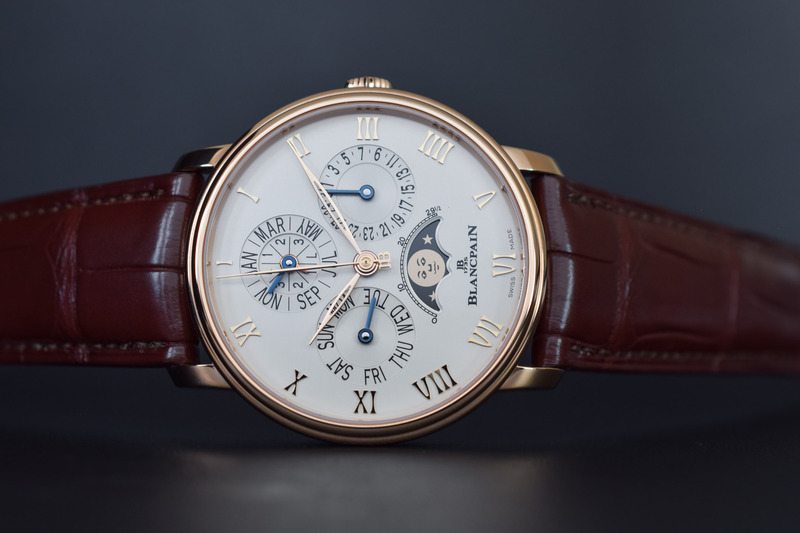 Calendar watches, in all their different modalities, hold a special place at Blancpain and this year alone the brand has unveiled the Villeret Quantième Complet GMT, a traditional Chinese Calendar, a Grande Date Jour Rétrograde and these Quantième Perpétuel Ref. 6656 models in rose gold and stainless steel. 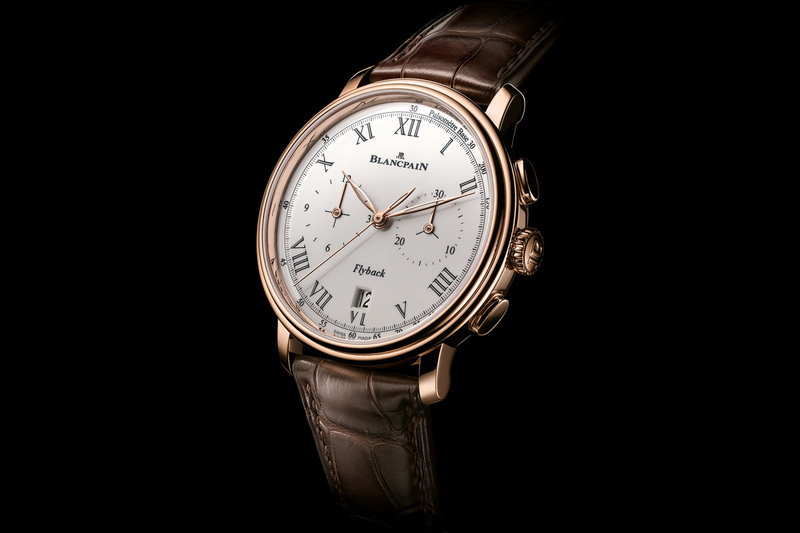 Marked by pure classic lines and an elegant profile, the Villeret collection is characterised by a double stepped bezel and is Blancpain’s ambassador of timeless elegance. Beyond its purely decorative function, the stepped bezel visually reduces the case height of 10.70mm and the sloping lugs allow the 40mm diameter of the case (an increase of 2mm over the previous 38mm perpetual calendar Ref. 6057) to sit comfortably on the wrist. A more contemporary size, the watch is presented in a luxurious 18k red gold version and a more ‘democratic’ stainless steel model with a slightly more contained price tag. The old ref. 6057 in 38mm (left) and the new ref. 6656 in 40mm (right). Note that both watches are currently coexisting in the collection and that the 40mm doesn’t replace the 38mm. These 6656 models also feature the user-friendly and invisible under-lug correctors. Patented by Blancpain and first introduced in 2004, these unobtrusive correctors are hidden under the lugs and let you perform the adjustments with your fingertip. This ingenious mechanism avoids the use of fiddly pushers or tools and the ugly presence of dimples or micro-pushers located on the sides of the case. Note the specific “under-lug” correctors, to adjust all the calendar indications. 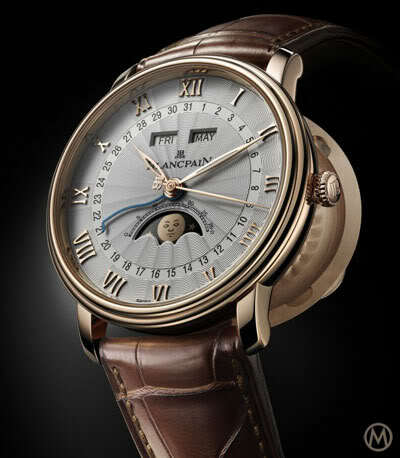 With exactly the same layout for the perpetual calendar and moon phase functions as the previous edition (Ref. 6057), with months and leap year indication at 12, days of the week at 9, date at 3 and moon phases at 6 o’clock, there are some important design tweaks, some of them targeted to give the watch a younger face. 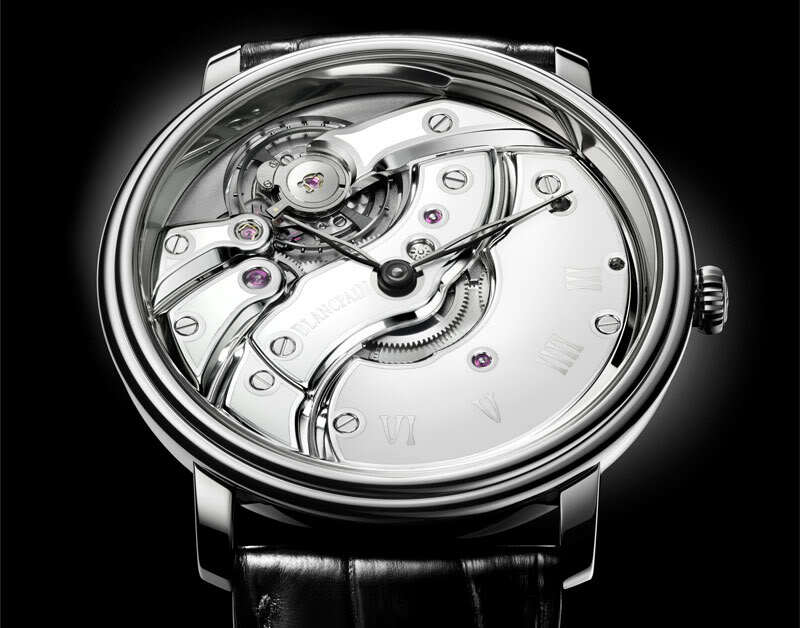 The most salient one is the incorporation of a central seconds hand with a JB counterweight – referring to the initials of the founding father. The second bit of fine-tuning is the elimination of the inner stepped ring that contained the displays of Ref. 6057, although the bezel of Ref. 6656 dips ever so slightly to give a greater sense of depth. With no container, so to speak, the sub-counters occupy more space on the dial creating a more expansive view of the functions. The hands of the counters are now picked out in blued steel and have less pointed tips for a more contemporary look. Speaking of hands, the hour and minute hands have been skeletonised for a clearer view of the dial. Even the ‘man in the Moon’ face is bolder and his expression highlighted with thicker strokes. Another fun detail that is easy to miss concerns the Roman numerals. 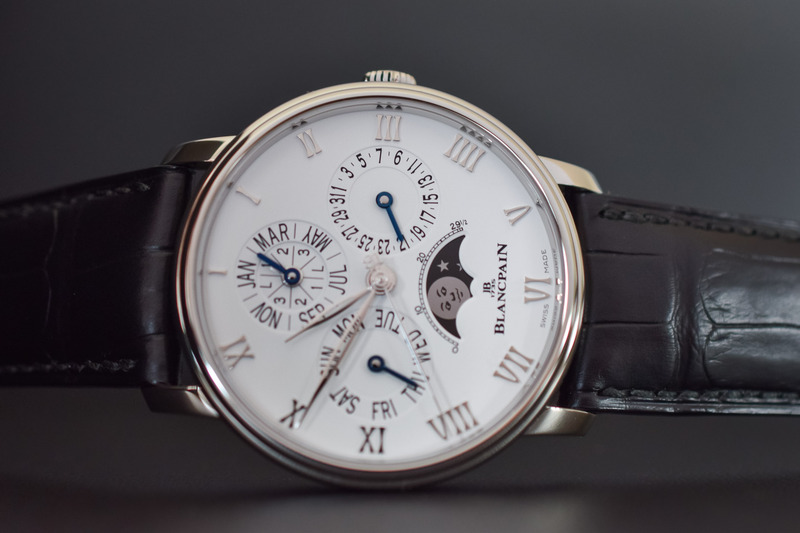 Applied to the dial and made in Blancpain’s dedicated Villeret font, the Roman numerals have been fattened and flipped right side up (V, VI, VII and VIII). And for those of you wondering why the Roman numeral IV is interpreted on the dial as IIII, don’t miss Brice’s epic work of sleuthing in this article. As you know, perpetual calendars are wonderfully complex entities but devilishly delicate if you fiddle with them at the wrong time. In fact, fiddling with the calendar functions at the wrong time of day (usually between 8pm and midnight), when the gears are in action, can result in an ambulance ride to the service centre. 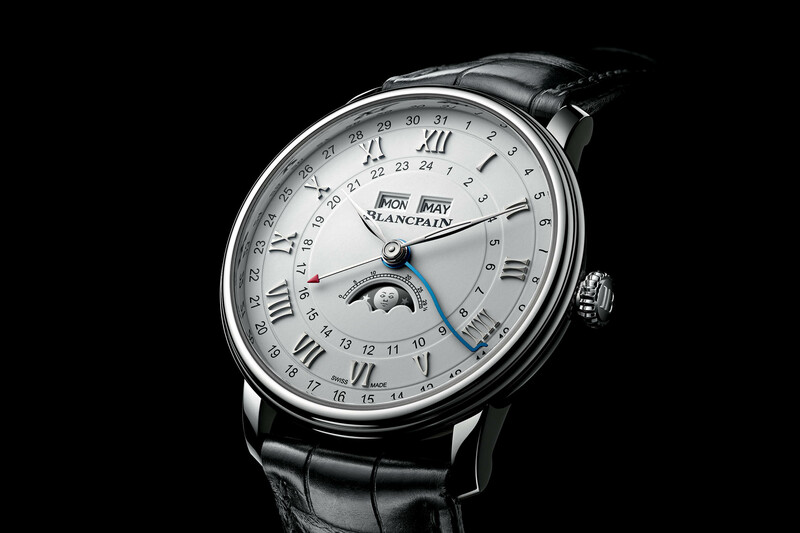 In 2009, Blancpain unveiled an industry first with its Calibre 66R9, a complete calendar with moon phases. The novelty was the complete freedom to adjust every single indication at any time of the day without risk of damage. This technology, known as a secured movement, represents a huge breakthrough for users. Even if you were to adjust the calendar during its midnight change, the mechanism blocks avoiding any potential damage. The engine keeping all the functions in perfect synch is Blancpain’s Calibre 5954, an automatic movement of 351 parts, a robust 72-hour power reserve and a modern silicon hairspring. Another change you can observe on the movement side is the decorative treatment of the solid gold oscillating weight covered with a rich honeycomb pattern. The previous Ref. 6057 featured Geneva stripes and the upgrade is much appreciated. 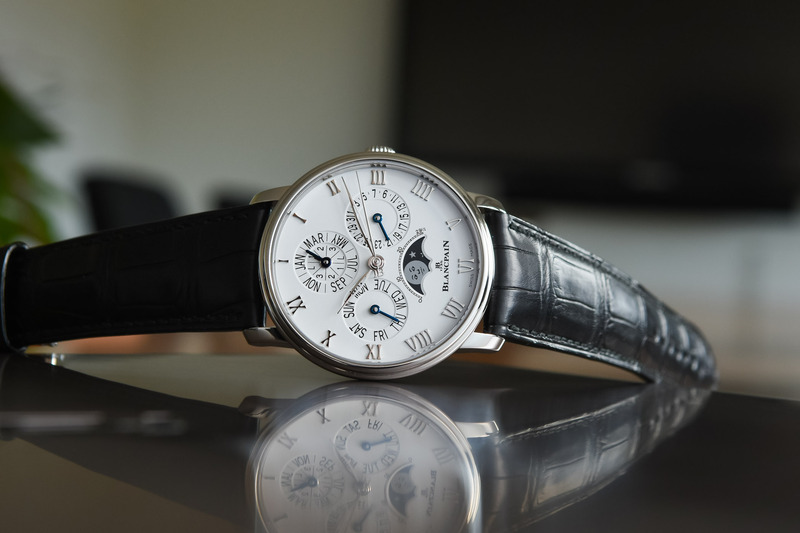 Yes, it is a classic Blancpain, with a classic Blancpain calendar and moon phase complication, classic Villeret styling and classic Haute Horlogerie finishes. 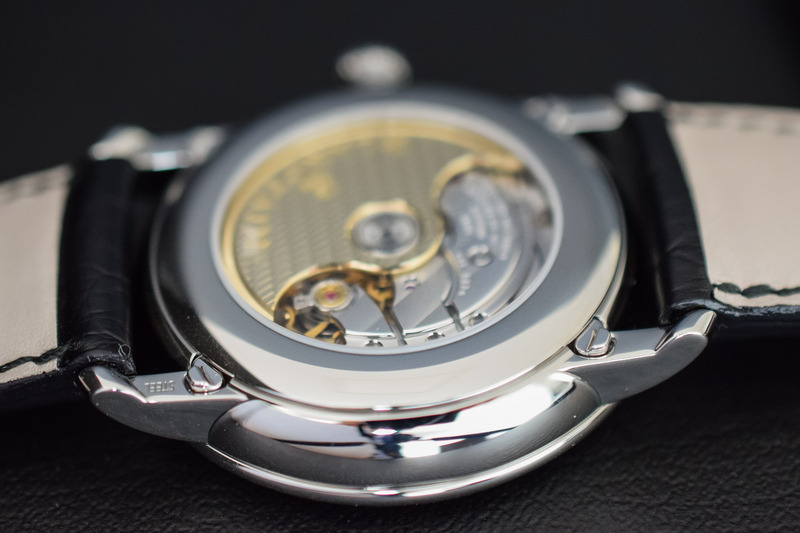 If classicism were a 10-rung ladder, the tweaks effected on the dial, the increase in case size to 40mm, and the option of stainless steel would situate this watch on rung number 9. Still classic, but not intimidatingly classic. The fact that it has been produced in stainless steel definitely gives the watch a more contemporary edge and a slightly more affordable price tag (CHF 10,000 less than the red gold) and the steel on steel bracelet version is particularly attractive, without looking too gentlemanly. I’m not sure I like the counterweight on the seconds hand because it interferes with the dial. But overall, the dial is more expansive, more inviting and certainly easier to consult. Available on classic alligator strap, the Villeret Quantième Perpétuel can also be ordered with a comfortable “Mille Maille” stainless steel or red gold bracelet, all options presented with a folding clasp. Not a limited edition, the stainless steel model on a leather strap retails for CHF 32,000 (incl. VAT) and the red gold for CHF 42,000. The price goes up somewhat for the models on a metal bracelet. The steel bracelet retails for CHF 34,200 and the red gold bracelet for CHF 60,100. 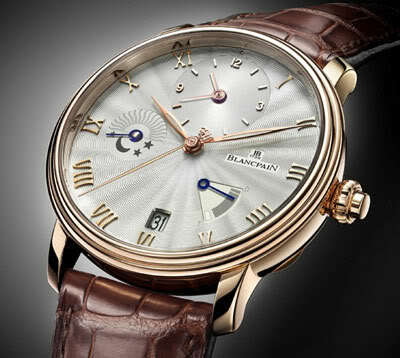 More information on www.blancpain.com. I might’ve said that with LeCoultre’s Master ultra-thin steel QP costing ~CHF 10,000 less than this, Blancpain may want to consider a bit more of a ‘contained’ price, but the movement and the superb corrector system makes it special. You still can’t wind it backwards, though. H Moser’s sublime perpetual remains the one to beat on that level, or Nardin if you don’t mind the sh*t dial. 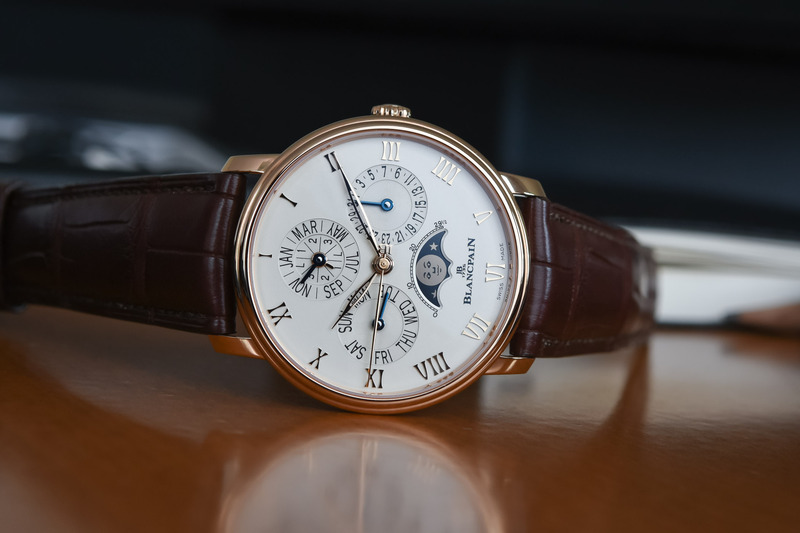 I love that watch, certainly more than the JLC model….it’s still the price tag….I mean IWC offers their in red gold for just 6K more than the Blancpain steel version and you get the year displayed as well….I think with a 20% less, a better competition would be achieved…..